The Supreme Court convened for its December sitting this week, and it may deliver its first opinions of the term as soon as Tuesday. But while it goes about business as usual, some worry that the famously cloistered institution is becoming too cloistered, its ranks filled more and more with blindered Ivy League elite. In November, Dahlia Lithwick, Slate’s Supreme Court writer, wrote an article for the New Republic titled “Yale, Harvard, Yale, Harvard, Yale, Harvard, Harvard, Harvard, Columbia,” a reference to the law school alma maters of the current justices. Even if that’s true, one meaningful fact is overlooked in Lithwick’s piece: Not all elite law schools are created equal. And, of course, neither are all elite lawyers. Prestige comes in many political flavors. Using two data sets — a long list of current and former clerks and a measure of justice ideology — we can paint a picture of the widely varying political ideologies of top law schools. First, there is a list on Wikipedia of nearly 2,000 law clerks, their law schools, whom they clerked for, and the years they began and ended their clerkships. The usual caveats apply to information on Wikipedia, but I searched for corroborating sources for many random entries on the list and found them in every case. The clerks are incredibly important judicial players. A given justice typically employs four clerks. They cull the thousands of petitions for certiorari, and are largely responsible for researching and drafting opinions.1 The positions are obviously prestigious, and they pay well. While clerks make a respectable $75,000 working for the court, former clerks’ signing bonuses at big law firms flirt with the $300,000 mark. As Lithwick’s headline may have betrayed, Harvard and Yale are the runaway leaders — they account for more than 42 percent of all clerkships. 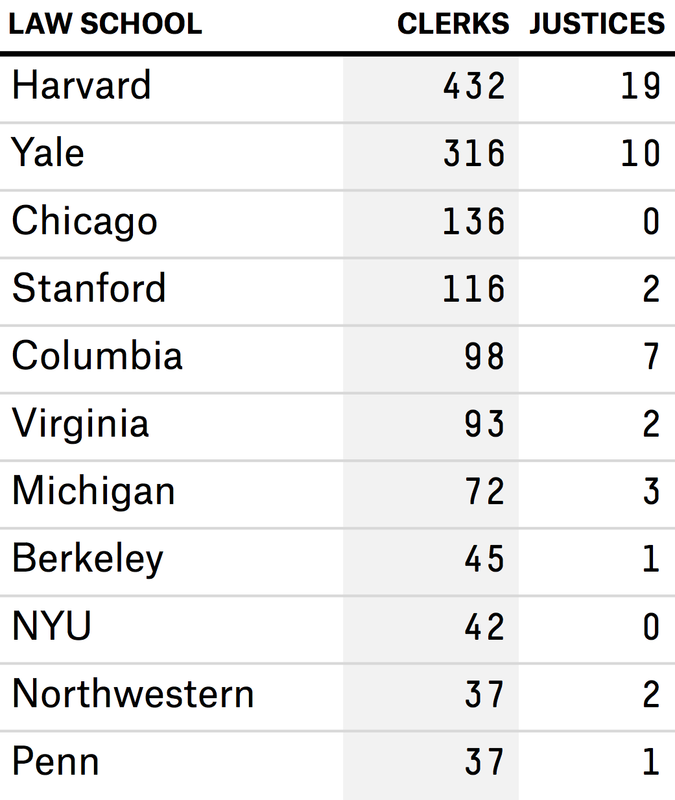 The University of Chicago2 is an interesting outlier. Its law school has produced well over 100 clerks but never a justice. The second source of data comes from political scientists Andrew Martin at the University of Michigan and Kevin Quinn at the University of California, Berkeley. Their Martin-Quinn scores quantify justices’ ideologies on a left-right political spectrum, based on their judicial opinions. These are similar to DW-Nominate scores, used to quantify ideologies of legislators.3 The scores as estimated range from about -6 (William O. Douglas) to +4 (William Rehnquist). They can also account for justices’ ideologies varying over time, which they certainly do. Living up to its reputation, Berkeley is the most liberal of the elite law schools. The median Berkeley clerk works for a justice with a Martin-Quinn score of -1.3 — about the equivalent of Stephen Breyer. On the other side of the spectrum, the median University of Virginia clerk works for a justice with a Martin-Quinn score of 1.3 — roughly Anthony Kennedy in his more conservative years. 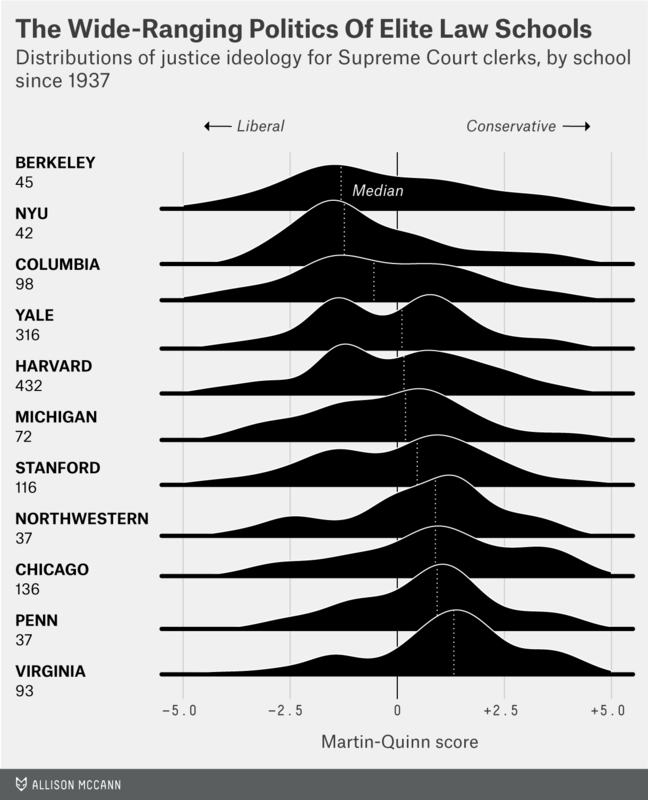 The median clerks from Harvard and Yale — Lithwick’s main culprits — fall very near the ideological center. But, interestingly, those distributions are strongly bimodal, with peaks left and right of center. This points to both a strong left and a strong right contingent of clerks from these schools. The same is true of other schools — Stanford and Chicago, for example — but those are more right-leaning in general. Lithwick stops short of proposing solutions to the “too smart problem,” other than urging progressives to identify candidates who might otherwise fly under the radar. But one can rest easy in the fact that elite schools are producing lawyers and clerks of all ideological stripes. It may well be, though, that not enough pigs are being aggravated. CORRECTION (Dec. 6, 6:25 p.m.): A previous version of this article incorrectly said that no current justice had ever served in the military. Samuel Alito served in the Army; no current justice is a war veteran. For the gory details, see this paper: Andrew D. Martin and Kevin M. Quinn. 2002. “Dynamic Ideal Point Estimation via Markov Chain Monte Carlo for the U.S. Supreme Court, 1953-1999.” Political Analysis. 10:134-153. The densities shown are smoothed in R using a Gaussian kernel.